I've been struggling with this logic problem for 17 hours now in total. Finally got to solve it after intensive research. So, if you're using playMaker, and the XBOX 360/One Controller is the main input device for your game, and you're wondering why you can't get the Triggers to work, this is for you. 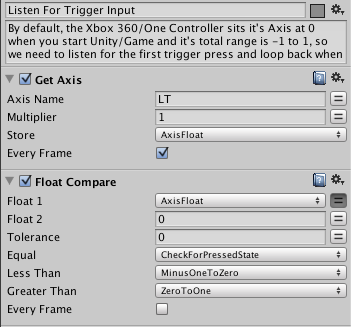 Microsoft made the Triggers to be sensible, therefore, they're Axis, not Buttons, in order to allow acceleration. The problem: Even though you can get the Axis, how do you solve the acceleration? Why it starts in a already fired state? The solution: The Axis range are -1 to 1. So why? Here lies the problem - The triggers are parked at 0 by default. From here, you can work your way to the solution, the images should be enough for a clear explanation of the logic. Notes included. can you upload them somewhere (not in your dropbox) and reconnect them? Thank you for the heads up. I forgot that OS X makes TIFFs by default, my bad. The PNGs from imgur should be working now. So in other words, to make the trigger buttons to work. 0 on the trigger axis means its inactive, but for example to fire a weapon tell playmaker to detect 1 on the axis that the trigger is on, that should allow you to fire your weapon. untill you let go of the trigger and go back to 0 on the axis, and that will stop that fore action. Almost. It never goes to 0 again. On the moment you start pressing the trigger, it will become the range -1 to 1. Just like a car's accelerator pedal. As you press for the first time, and keep pressing further, it will start the linear progression of the axis, -1, -0.9, -0.8... until it reaches 1. In your example, once you release the trigger after shooting your weapon, the trigger will decrease its axis from 1 to 0.9, 0.8... going through 0, until you fully release the trigger and it rests at -1. You can link an action to any of these values if you want, for example, so the weapon only shoots a bit late but not so late, let's say, at 0.3. Or implement an acceleration action, like stretching a bow string to shoot an arrow for example, and depending of the stretching strength, a different damage is applied. It's a very odd behavior, it should start at the range, but it starts at 0 instead, to never go to 0 again once pressed for the first time, unless you quit Unity or the Game. You can use the Controller Tester asset from the asset store to observe this behavior, it's free. If you think this is a bit complicated, wait until you have to work with the Steam Controller, which has it's triggers working as an axis and buttons at the SAME TIME. I hope the behavior is separated, and not hardcoded into a single bahavior. My guess is that it will have a "click" virtual (or maybe physical) button at the end of each range, working as a real button, to separate itself from the accelerating range behavior. If my guess is somewhat correct, then it will not be so complicated at all. So the triggers starts at 0, but when pressed it no longer will stop at 0 but actually start from -1 and go to 1, then when the trigger is let go; it goes down back to -1. Now for my game i think this will be easy. All i have to do is anything greater than, lets say 0.1 fire weapon, then anything less than 0.1 stop firing. Is this correct? Reason im asking becuase i beem trying to make the triggers work as button for a long time. Now with your post i think i can finally use the triggers as buttons. Yup. That will do it. As long as you set up your actions for it to work like that. Any other value will work as well, as long as you set at least one value, it will work. What will differ is the timing, close to -1 it will trigger really really fast, closer to 1 it will take a full push of the trigger to activate and will of course take longer. In my post example, I'm listening to really anything, any value that is not 0. Because I didn't care for how much further the player would press the trigger, I just wanted it to act like a simple button. Yeah, I feel ya, I wanted to achieve the same thing, and was able to, using the method I described in this post. A. a option to toggle the triggers to be axis triggers, button triggers, or pressure sensitive triggers. C. Actually expain this in the Unity manual, because I dont think I really read anything about this. Thanks a ton for this post. When i get home from work ill try this out and set 0.1 as the event to send, and see if it actually fires my weapon. Built in support for Controllers in Unity is not good. Just about everyone uses InControl or ReWired nowadays. As Lane pointed out, you can get good assets from the Asset Store to deal with that. You'll need something much more robust and standardized for a multi-platform release. I personally don't need it yet, but I'll use InControl myself on the final release. In case you decide to use an external asset, now, in the future or at any moment, one thing to consider when choosing the asset is paying attention on the support and stability of the addition of new controllers, or new controllers versions, like for example, the Steam Controller, that may or may not become popular. Or, as another example, the revised version of the XBOX One Controller, the XBOX Elite Wireless Controller that will release soon, that adds new buttons and new behaviors. Just to follow up. I am actually using windows for my project. In windows the LT and RT are actually 0 to1. Unlike Mac its -1 to 1. So its eaier to program LT and RT in windows platform. Also i manage to program the whole 360 controller for my project and everything works great. Might be easier for you sure, but not to the player playing your game on OS X, which will have the triggers working differently. Either simply keep separate builds for each platform or just use a third party asset to help dealing with that. Quality porting is not so simple, but can be less problematic with the help from third party assets. Thank you so much for this information. It was really helpful for setting up controller input in my project. I'm building on Windows 10 with Unity 5.3.4, using an Xbox One controller. The LT is bound to the 3rd axis, and the RT is bound to the 6th axis. It was previously mentioned in this thread that using Windows it only ranges from 0 to 1. In my experience in this past week, on PC my triggers do range from a value of -1 to 1, just as Mac does. Left Trigger - 3rd axis, ranges from -1 to 1. Right Trigger - 6th axis, ranges from -1 to 1. DPAD Horizontal - 7th axis, ranges from -1 to 1. DPAD Vertical - 8th axis, ranges from -1 to 1.